Exit intent popups are the second, and often the last chance you have to convert a visitor. Take advantage of this critical moment, show just before they exit a personalized message that speaks directly to their specific needs with a value proposition they can’t refuse. Use smart behavioral triggers such as trigger on exit intent, on idle, on timer, on product added to cart, on cart error, and more to trigger campaigns when the visitor is most likely to engage, or most at risk of bouncing. With complete control over your exit popup look & feel. 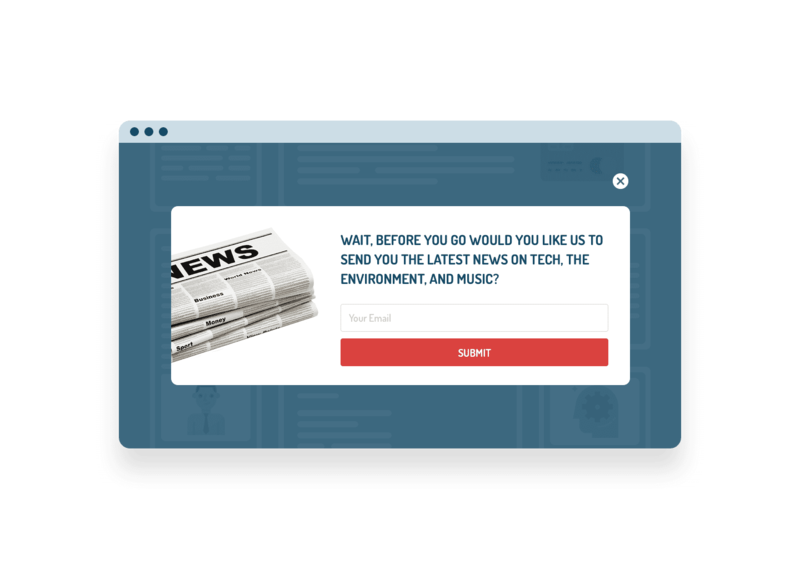 Responsive and easy to customize exit popup templates. 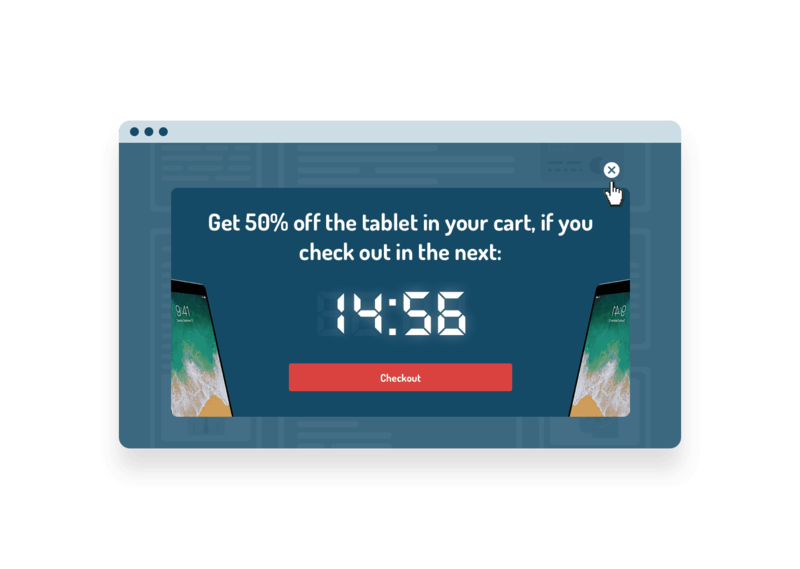 Trigger exit popups with content or product recommendations, auto-store locator map, personalized call to action, opt-in forms with dynamic selection, and many more. 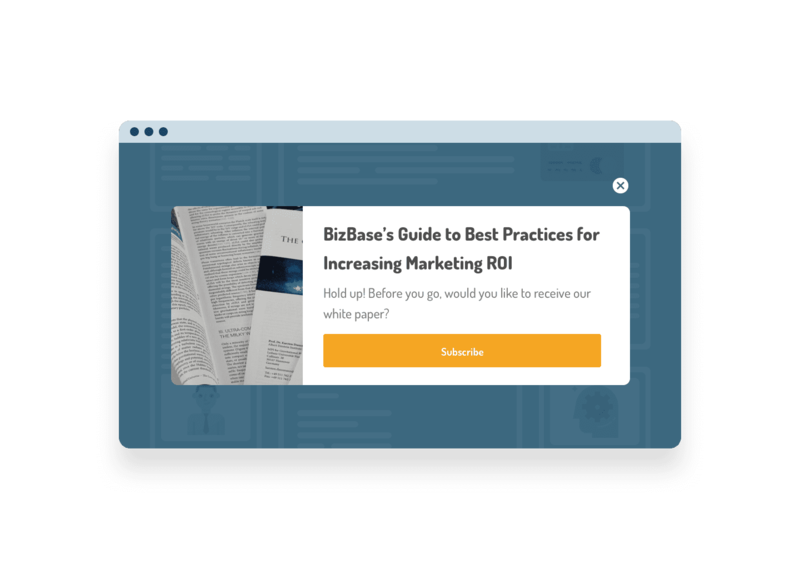 Popups are most likely to re-capture their interest, when the content is highly personalized and targeted, and you can also set an automated sequence of personalized emails based on their interaction with the popup. You can display any recommendation design and algorithm you want in your exit popups. 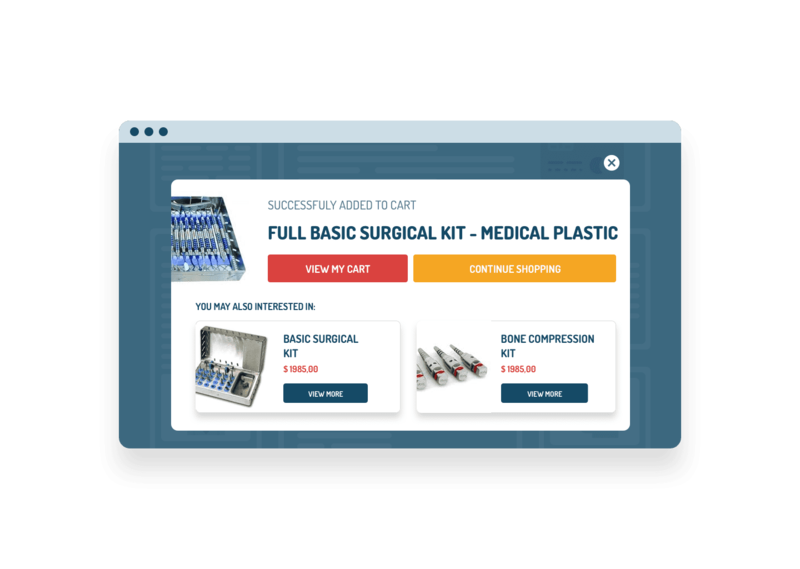 For example, if a visitor bounces from a product page, show them an exit popup with similar products, or the same for content. If they bounce with items in their cart, show them similar items. Personyze has a dynamic map marker, or auto store-locator tool which allows you to show visitors the nearest store or branch to them, on a map. 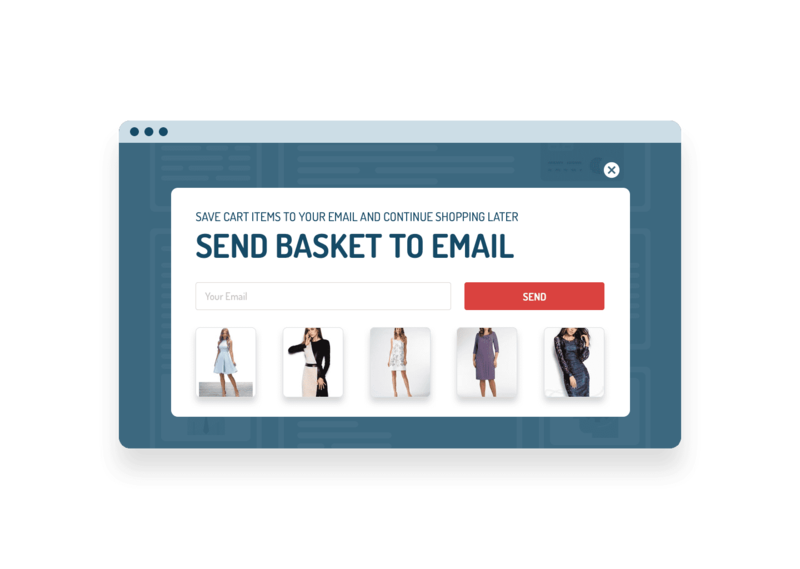 This can be shown in an exit popup, for instance if someone bounces from your clothing website, you can suggest they come in to their nearest branch, and try on whatever they were interested in. Different calls to action make sense for different segments, so with Personyze you can make sure you deploy the ideal CTA to the right customer, using our powerful segmentation engine. If a visitor tries to bounce with items in cart, you can ask why they are leaving, if price was too high, or what was the reason? Show a bouncing visitor a form, which will automatically send an email when they submit. 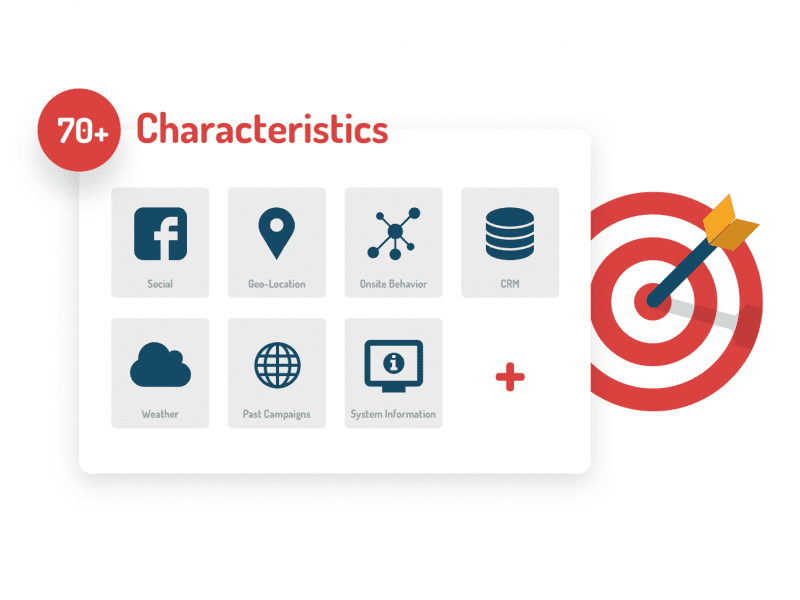 Improve campaign effectiveness by targeting exit intent popups selectively, to the segment for whom they are most relevant, based on our 70+ audience targeting rules, including CRM variables, dynamic session data such as cart value, referral, pages visited, weather, geo-targeting, and many more. 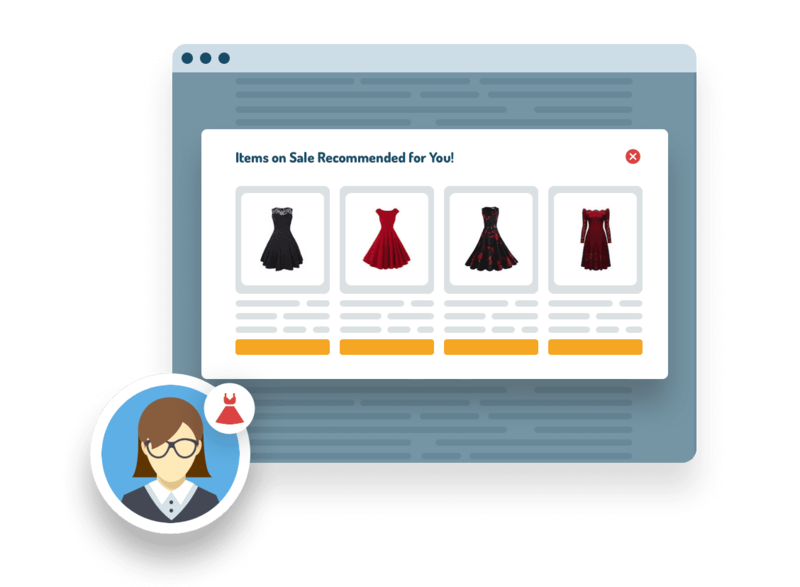 Both AI generated recommendations as well as targeted content can take into consideration the interactions that the visitor has had with your products or content. Examples of interactions with specific products or content are views, adding to cart, commenting, liking, favoriting, purchasing, etc. Our system knows the visitor’s location based on IP intelligence, and therefore also knows the current weather forecast for that location in detail. 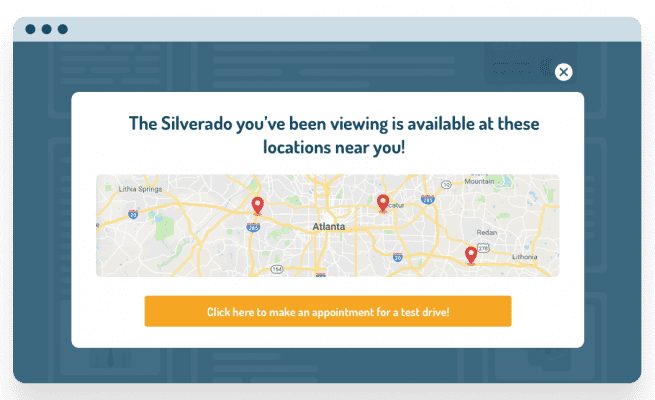 You can include or exclude visitors in your exit popup campaigns from various cities, regions, and countries in your campaigns, as well as based on aspects of their weather such as temperature and precipitation. 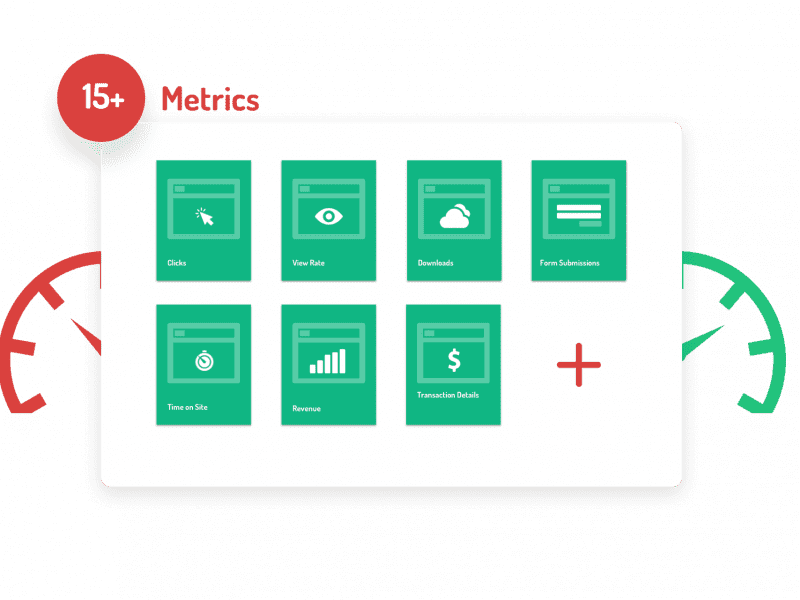 Utilize a real-time campaign performance dashboard, Rotate Exit Intent Popups between different users for A/B testing, or rotate between pages to maximize exposure. Auto-deactivate if they don’t reach a certain number of impressions/clicks, or if their conversion rate is too low. Track and get email alerts on multiple performance metrics for a given visitor segment, including transaction value, click through rate, sign ups, and more. Limit your popups to stop showing after a visitor has seen or clicked on them, for X number of sessions, to avoid annoying visitors. Find the exact content, layout, and behavior that get the most engagement and conversion from your exit intent popups, and pick the winner manually or have it automatically deployed. 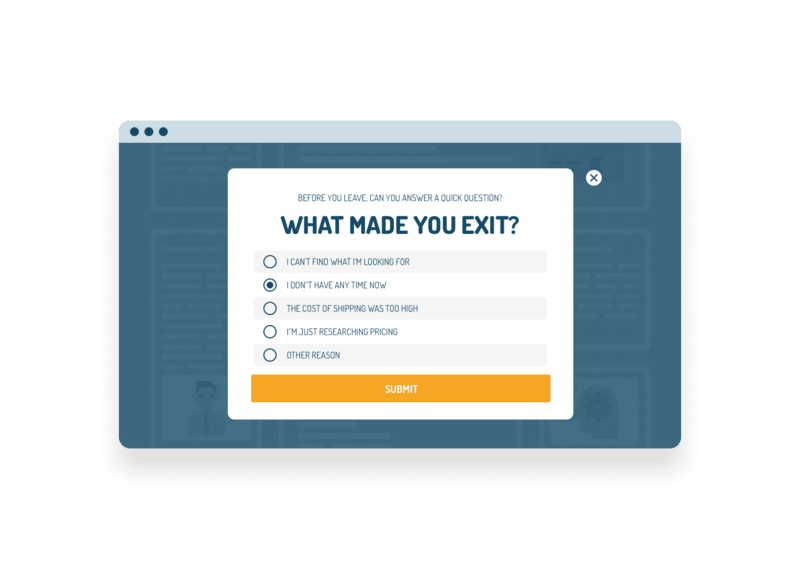 Our step-by-step wizards guide you through the process of creating personalized exit intent popup. Industry best practice responsive templates make the process even easier. Grow your email list with targeted calls-to-action and smart forms to collect emails and leads on the site, and set auto-responder sequences. Push form data to your CRM solution. With minimized popups, you can set the initial state, whether it’s open or closed, and also remember and maintain the state throughout navigation from page to page. No matter how great your website is, some users are going to bounce. 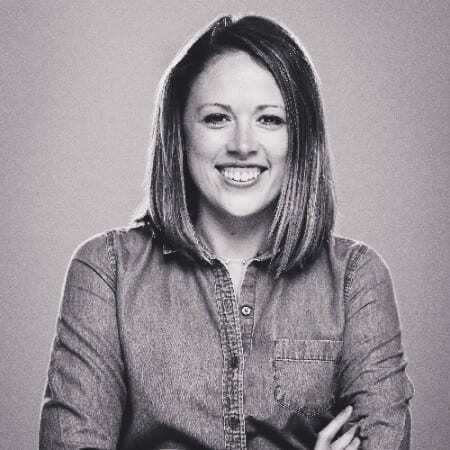 As an online marketer, the question is, how do you capture a visitor’s attention at the moment when they are losing interest, and make them think twice about it? 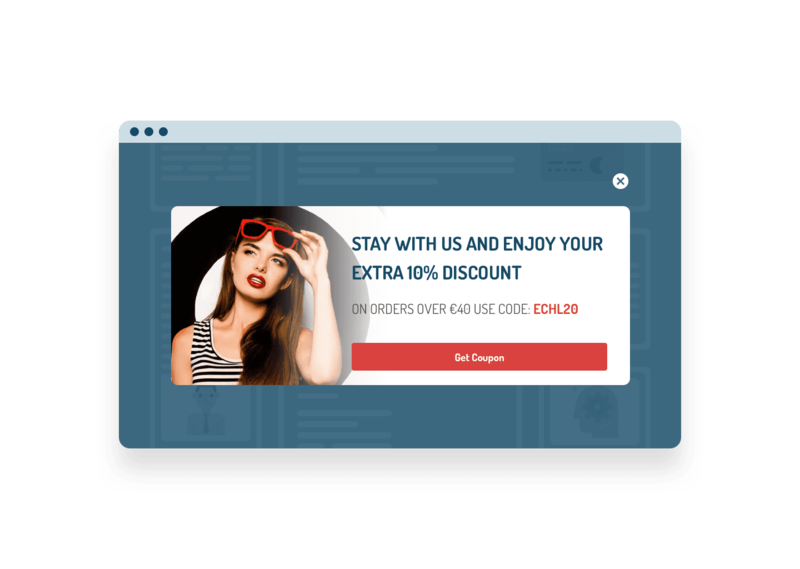 This is transforming bounce into conversion, and one great way to do it is with a personalized/targeted exit popup leveraging exit intent technology. Step-by-step wizards guide you through the process of triggering exit popups with personalized content. Industry best practice responsive templates for exit popups. Trigger exit intent popups based on any CRM variable by using out-of-the-box integration to synchronize your CRM data. Every custom field you create (user industry, account type, etc.) becomes a personalization tag that can be inserted into your exit popup creative, for a more personalized experience. 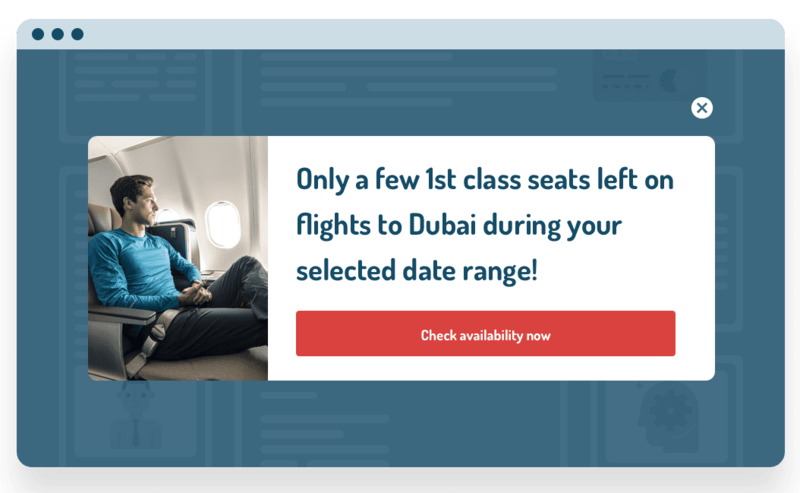 Preview your exit intent popups before they go live, by impersonating different visitors with different characteristics, to see how your campaigns will behave for those segments. Grow your email list with targeted calls-to-action and smart forms to collect emails and leads on the site, and set auto-responder sequences. Use out-of-the-box integration to push form data to your CRM solution. Present visitors with the most viewed/booked, bought, or read content or products for this week, based on visitor location, demographics, and known personal interests, as derived from on-site behavior and other sources. Automatically turn your promotions on or off when Personyze detects higher traffic, calls, or form submissions, so your promotions only apply when timing is optimial, not only for the visitors but also for your business, when you need the push in sales the most. By default, Personyze reports campaign performance in real-time to Google Analytics. The moment you publish a exit popup campaign live on your site, data on it’s performance is sent to Google Analytics, by default.